On the 2nd of April 1638 there is a colonial record that William Maycumber, spelled Macomber in later entries, was licensed to dwell in the Plymouth Colony. The record lists William as a coop, which is his trade. A coop or cooper is a maker of barrels or casks. He apparently had brought proof of his apprenticeship signed by a master cooper. Evidence of the importance of this skill to the colonies shown by additional records showing he was granted land on the north side of Powder Point to obtain timber for his trade. 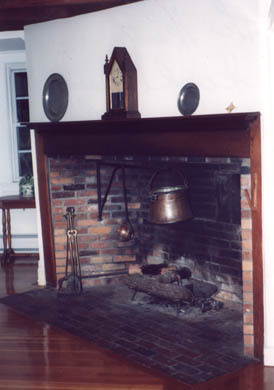 In 1640 he was granted the wood growing on Wood Island for use in his coopery. As the Colony of Plymouth grew a new town was formed about five miles north of Duxbury. It was what we now know as Marshfield. William became a resident of this town. Of interest is a statement dated October 3rd 1650 signed by Miles Standish and John Alden where they established and surveyed the area to establish the land boundaries for William and his neighbors. There are a number of instances in colonial records that show William as a resident of Duxbury and then Marshfield. In a 1643 census he is listed as living in Duxbury and able to bear arms. In Marshfield records he is shown as having been a witness in a trial and in 1655 he stated his age as 45, therefore he was born in 1610 to John Macomber and Edith Locke in Dorchester England. 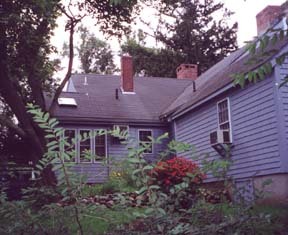 The home that William and Ursilla built in Marshfield still exists at 672 Summer St., Marshfield Hills, MA. The original house was a garrison house (like a fort) for protection against the Indians, the ends of brick, the rest of wood. The house was torched during the King Phillip's War in 1675. 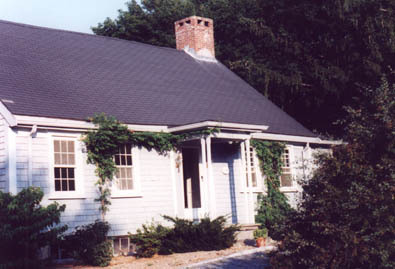 Some of the following comments about the house as it was rebuilt are by the present owner who has developed a great interest in the Macomber history. While he is not a Macomber, the last family member being Ruth who sold the house in 1945, he reflects "That any one who cherishes this place is a Macomber" It is indeed is an interesting place to visit. The Macomber's rebuilt, preserving some of the original charred timbers in the ceiling of the basement. They were loyal to the King during the Revolutionary War and their home became a garrison for British soldiers. The plaster along the front hallway is still scarred by the bayonets and rifle butts of soldiers passing through. I am not sure if the family members were indeed Loyalists as records show that many Macomber men fought the British. However, Marshfield at the time was very close to becoming a Loyalist town. At one time the Loyalists were in control of the town and then the patriots would be in power. A steady conflict between Whigs and Torries. Following the war some loyalists were removed to Nova Scotia. As the Macomber's remained they may not fact have been strong supporters of the King. On the other hand many business men did stay loyal. It is possible the Macomber's kept slaves: In her will, Joanna Macomber, who died unmarried in 1791 left her clothes and other personal items to "my black woman, Jemima Hommany". Perhaps she was her servant as it was against the law to have slaves in Massachusetts. The Macombers prospered in the early part of the 19th century, and than their fortunes slowly declined. Today up in what is called the slave quarters is a barrel. The Macombers used to squat in it when the barrel was outdoors in order to look out the holes and watch for Indians. It is probable that early generations were buried not far from the house. South of the house a short walk on the opposite side of the road the road are several large stones that may mark the tomb. Not far from the house is a street sign that reads MACOMBER RIDGE. If one follows the road to the East you will come to a marsh that floods at high tide. Across the marsh is an area known as Macomber Island. One needs to be alert for the change of the tide if they venture out on the road. Also near the house is a monument showing where the railroad station was located. Members of the family ran a horse and buggy service for train passengers in early days of train service. There is also a possibility that at one time they were rum runners; but who or when I do not know. As noted above the span of the Macombers in this house built by William 1 continued until 1946.